Before starting with the series, I will post on the basics you need to know for myopathies. Q. What do you mean by muscular dystrophy and myopathy? A. I found that following definition from Harrison is simple. Skeletal muscle disease myopathies, are disorder with structural changes or functional impairment of muscle. Muscular dystrophy refers to a group of hereditary progressive diseases with unique phenotypic and genetic features. Do you know glycogen storage diseases? There are some glycogen storage disease which will lead to myopathies. For now remember that myopathies have different way of presentation. Muscle weakness is one of the clinical feature. The muscle weakness can either be 1. Intermittent or 2. Persistent. If there is energy deficiency in muscle, it will become weak. Today, we are focusing mainly on skeletal muscle energy metabolism. Glycogen storage disease are described in the Roman numerals. Not all glycogen storage disease lead to myopathies. 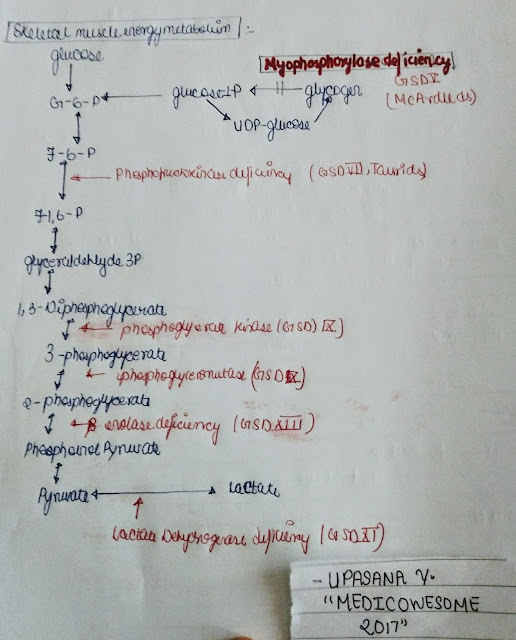 Some glycogen storage disease lead to myopathies is mentioned in the diagram.